Intel Coffee Lake Refresh processors have been spotted overclocking all over the web, but now we’re getting a rare glimpse of benchmark data showing how the rumored Intel Core i7-9700K will perform. PCGamesN picked up on the purported 8-core/8-thread processor appearing in the Geekbench database complete with a 6,297 single-core scores and 30,152 multi-core scores. Comparatively, the last-generation Intel Core i7-8700K processor achieved 5,508 and 25,034 point results in the same respective tests, while the AMD Ryzen 7 2700X performed gallantly with 4,998 single-core and 26,011 multi-core scores. Now we fully expected higher single-core performance simply by way of the 9700K being rumored to have a 200MHz faster boost clock than its Coffee Lake predecessor. However, the significantly improved multi-core performance is unprecedented considering this new processor supposedly won’t support hyper-threading and has four fewer threads than the 8700K and eight fewer threads than the 2700X. We originally thought it was odd that one of Intel’s flagship processors would lack its trademark hyper-threading feature, but perhaps Team Blue is onto something we don’t know about yet. Still, there’s no real way to ensure the validity of these scores, so we’re going to contain our excitement with bated breath for now. Of course, it wouldn’t be a typical week without us seeing yet another Coffee Lake Refresh processor overclocked ahead of its official announcement, and this time it’s the 9700K once again. 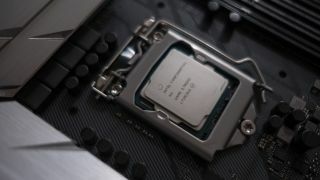 The Intel Core-i7 9700K was supposedly overclocked up to 5.3GHz, which is 400MHz higher than rumored processor’s 4.9GHz boost clock speed, by a writer at EXPreview. Though this rumored CPU has been previously spotted overclocking past 5.5GHz across all eight cores, this is still an impressive result given that the chip appears to have only been air cooled with a tower-style heatsink. Unfortunately, there were no benchmark scores to go along with the extreme overclocking, and otherwise the only thing validating this rumor are some of the most blurry and pixelated images we’ve ever seen – so we’re taking this report with an equally extreme grain of salt.